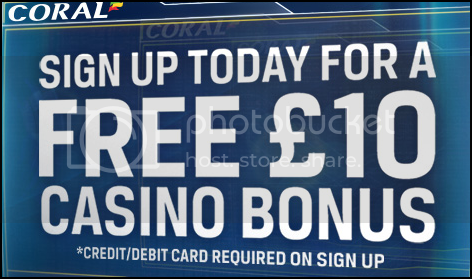 £10 No Deposit New Player Bonus At Coral Casino! Sign up with Coral Casino today, add a credit or debit card and get an amazing £10 no deposit bonus* to experience our 300+ games! With Coral Casino & Games, you're winning from the beginning! Corral Casino is powered by Playtech, IGT Gaming and Ash Gaming. Enjoy your Free £10 Bonus* on our 300+ Games on Casino, Games, Live Dealer and Casino Mobile. Simply play and follow the wagering requirements to turn you winnings into real cash!